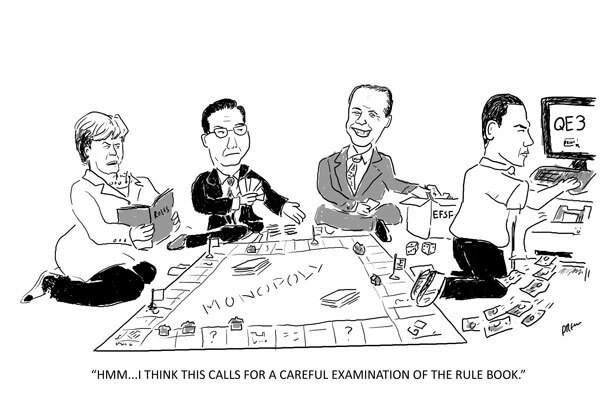 Continuing the CCGB caption compedition board game theme here is my take on the global economy. The markets have been in freefall this week and while some of the panic is media hype and market jitters the debt mountains of the US and European economies is a significant worry. So my (not very accurate) prediction for next weeks is that the US will announce QE3 (Quantitive Easing 3) i.e. printing money and Europe will buy Spanish and Italian bonds while beefing up the powers of the EFSF (European Financial Stability Facility). Markets will still fall. They are from left to right Angela Merkel (German Chancellor), Wen Jiabo (Chinese Premier), Silvio Berlusconi (Italian PM) and Barack Obama (US President). Of the four I enjoyed drawing Silvio and Barack the most and struggled alot with Angela.